Youth Hostel Oberammergau, Schulze Dinter Architekten | Photo: DJH Landesverband Bayern e.V. The Bavarian regional branch of the German Youth Hostel Association has launced a fresh, new design interpretation of the youth hostel concept. The history of the youth hostel began in an August night in 1909 in Bröltal in the Sauerland region. A teacher, Richard Schirrmann, took shelter with his students during a summer thunderstorm in a vacant village school when they were on a hiking tour. 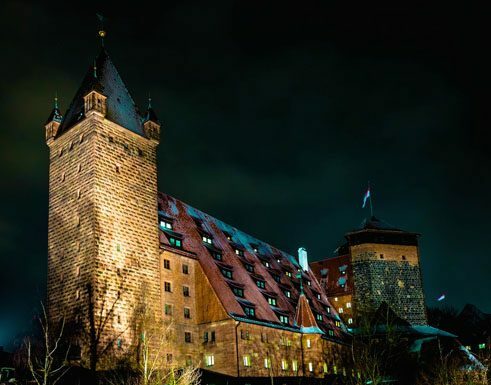 In that night, Schirrmann developed the idea of creating „a hostel for Germany's young hiking enthusiasts.“ In the beginning, schools and gyms were provisionaly equipped with straw mattresses, sheelts and wool blankets, in 1914 the first permanent youth hostel arose in the medieval castle of Altena. Youth Hostel Nuremberg, Fritsch+ Knodt & Klug mit Franchi & Dannenberg Architecture & Design | Photo: DJH Landesverband Bayern e.V. But just fourteen years later there were about 2200 of them throughout Germany, mostly with large dormitories and smaller rooms for minders. The idea quickly crossed national borders. Today, under the brand name Hostelling International 4500 youth hostels exist in 90 countries world-wide. In addition to an inexpensive travel option for young people of all countries, the concept of intercultural exchange and joint engagement for peace and international understanding are the central focus. The Nuremberg youth hostel, thoroughy renovated in line with historic preservation guidelines in 2013, offers a unique spatial experience (Fritsch+ Knodt & Klug with Franchi & Dannenberg Architecture & Design). The former Kaiserstallung (imperial stables) of the castle were destroyed in the Second World War and vers modestly rebuilt in the 1950's. Today it successfully combines the historic building with modern design and leading-edge technology. Youth Hostel Nuremberg, Fritsch+ Knodt & Klug mit Franchi & Dannenberg Architecture & Design | Foto: DJH Landesverband Bayern e.V. In an excellent location overlooking the Old City, an elegantly designed foyer with lounge, an modern bar and spacious dining hall welcome guests. Contemporary conference and seminar rooms are as much a part of the redesign as the QR codes on the walls, which – if one follows them on one's smartphone – provide uselful information about Nuremberg. All rooms have a private bath and are kept in a uniform design of wood, materials in white and restrained colours and with combinable single and double beds and cubic seating and storage furniture. 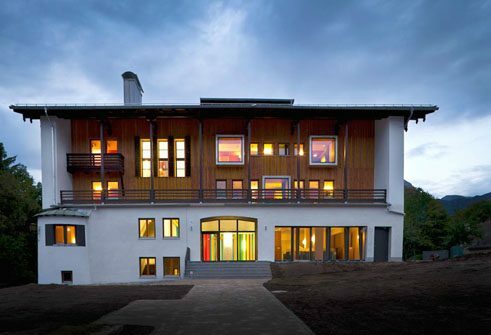 Youth Hostel Berchtesgaden | Photo: LAVA The LAVA architects have given the name „Alpines Resort“ to a thorough-going redesign of Youth Hostel of the nineteen-thirties; the Berchtesgaden youth hostel in a magnificent landscape at the foot of the Obersalzberg. The remodelled and rebuilt facility was opened in 2011 as the first „design youth hostel.“ It is the prelude to the strategy of the Bavarian regional association to adapt to contemporary usage needs in terms of design as well with high-quality architecture and modern comfort. Youth Hostel Berchtesgaden | Photo: LAVA Glass cubes jut out from the facade of the Upper Bavarian country house, and in th interior as well, existing structures have been broken up to form a flexible lounge area. The bright foyer is alight with the colours of the flags of all nations. Fresh designed single and family rooms, education and relaxing areas, the high-rope climbing park and the archery facility attract new guests, sports enthusiasts, recreation seekers, families and individual travellers. Youth Hostel Oberammergau, Schulze Dinter Architekten | Photo: DJH Landesverband Bayern e.V. 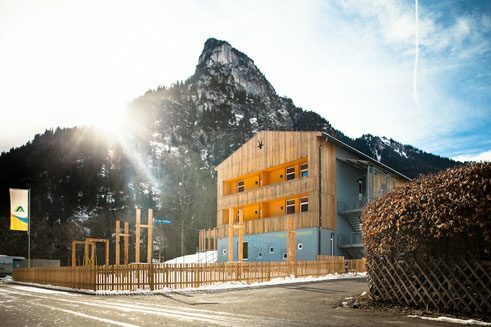 With renovated houses in Kreuth, Lenggries und Oberammergau, the Bavarian design offensive has revamped and remodelled additional alpine youth hostels. 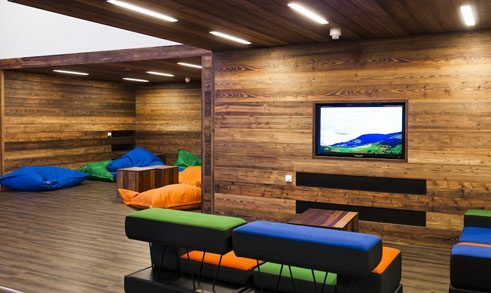 Here, too, strong colour schemes, natural materiuals such as felt, stone and wood as well as trendily exaggerated alpine motifs lend the youth hostels a fresh image. Youth Hostel Munich | Rendering: Graftt In terms of their design these new youth hostels can bear comparison with any design hotel, the crucial difference lies in their programmatic focus: communication and encounter. For the redesign of Germany's oldest urban youth hostel in Munich, the architectural firm GRAFT envisions a two-storey amorphous foyer landscape, where an exchange via projections and screens is possible. Youth Hostel Bayreuth | Rendering: LAVA In the futuristic new building of the Bayreuth Youth Hostel by LAVA, wich is to open in 2017, the central atrium of the three-wing building is the hub of entertainment, interaction and communication. Wide seating steps mediate between storeys, the interior and open-air spaces are connected via expansive terraces. Flexible walls, modular furniture, folding and sliding elements allow a variety of spatial configurations, many of which are also equipped for disabled persons. As Bavaria's first integrative youth hostel, Bayreuth is setting new standards for a reinterpretation of the youth hostel of the future that is contemporary, functional and sophisticated in design. Nicola Borgmann is working as a curator, architect, art historian and is leading the Architekturgalerie Munich.